Pretzel Logic's Market Charts and Analysis: Dollar on the Cusp of a Huge Rally; Gold Due to Correct Further? Dollar on the Cusp of a Huge Rally; Gold Due to Correct Further? The G20 met this weekend and announced that later this week it will detail plans to recapitalize Europe's banks and install a "firewall" to protect the rest of the Eurozone from Greece's problems. (However, there was no mention of what steps, if any, the G20 will take to protect the rest of us from the after-effects of Greek Ouzo -- so it's hard not to consider the summit a miserable failure.) France and Germany are under the gun this week to try to resolve their differences and come up with a "comprehensive plan" to resolve the sovereign debt crisis. Will the new plan work? The dollar chart is strongly suggesting that, whatever this forthcoming plan may entail, the market won't like it. On September 3rd, just before the dollar rally started, I presented a very long term chart of the dollar in which I suggested that the 2008 print low marked the end of a multi-century correction which began at the dollar's inception. I further suggested that a rally in the dollar was imminent. This prediction has indeed come to fruition, which gives me greater confidence in my count and view of the dollar's current position. The chart below suggests that the dollar is in the process of basing Minute Wave ii, which should lead to a strong third wave rally. The current wave ii-down has satisfied its expected requirements, and could base at any time, but short-term charts suggest the base may come later in the week (perhaps coincident with the Eurozone announcement?). This has been one of the things which has long fascinated me about Elliott Wave: the charts almost always seem to lead the news. France and Germany themselves may not even know yet what their new plan will be, but the charts seem to think it will be disappointing. It will be very interesting to watch what happens here. Gold, on the other hand, looks like it needs another move to the downside -- not surprising, if the dollar is on the verge of a big rally. 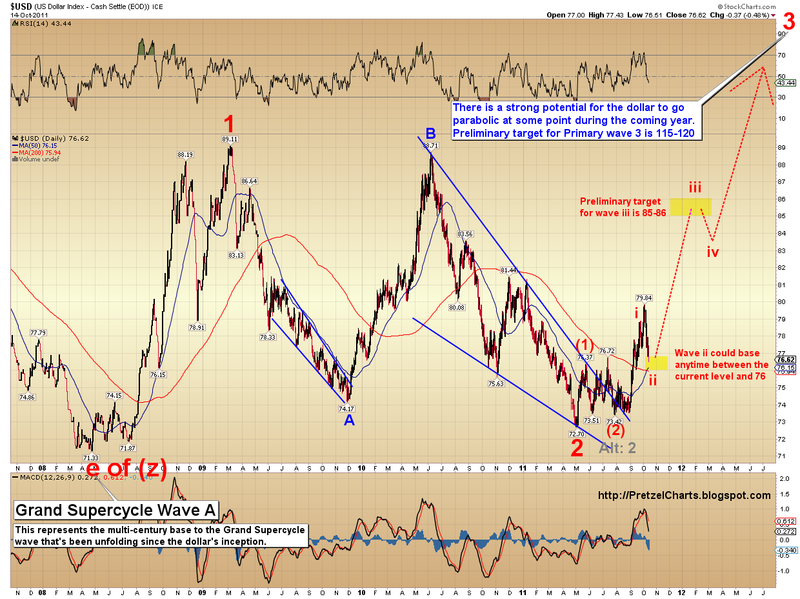 Gold currently appears to be in a fourth wave. Fourth waves are complicated sideways affairs, and difficult to predict short-term. My chart isn't intended to indicate what's going to happen today, it's a more intermediate picture. The position of the dollar, which appears poised to launch a massive multi-year rally, is one of the circumstantial factors that leads me to favor the view that the recent highs in gold may hold for some time to come. 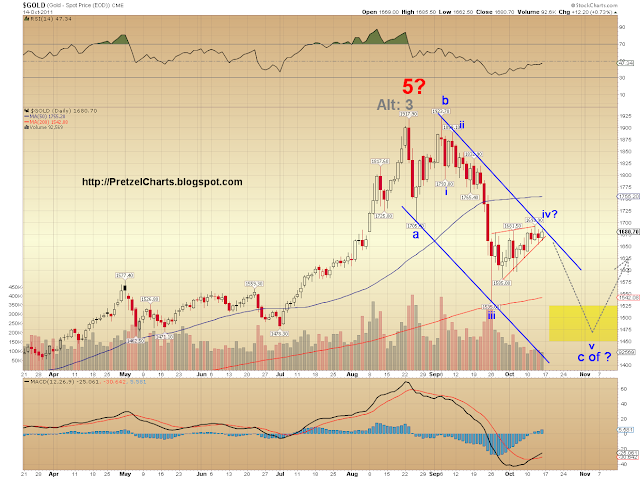 However, in particular with gold, I feel I need to see a few more waves in order to make an accurate long-term call. It will be interesting to see how this all plays out, and if, at some point in the future, the dollar and gold begin rising in tandem. Excellent charts and analysis, Pretz. Thanks much! You're quite the whizz here. I think we should all be aware that even correlations that go on for a long time can end at any time. E.g. at some point in time, the dollar, gold, and the stock market could all start going up together. But you make an excellent point, and your point is one of the reasons I didn't let the dollar chart be the factor that convinced me the gold run was over. I simply need to see more squiggles from the yellow metal before I make a call there. Good article, JK, thanks for the link. Hi thierry -- haven't charted the Euro in a while, so I have no price objectives there. As you said, though, should track roughly inverse to the dollar. I think if the equity markets are going down as predicted by your Elliot Wave Analysis, most likely it will drag down Gold and Silver with it because of forced selling, as they did in the great bear market of 2008. 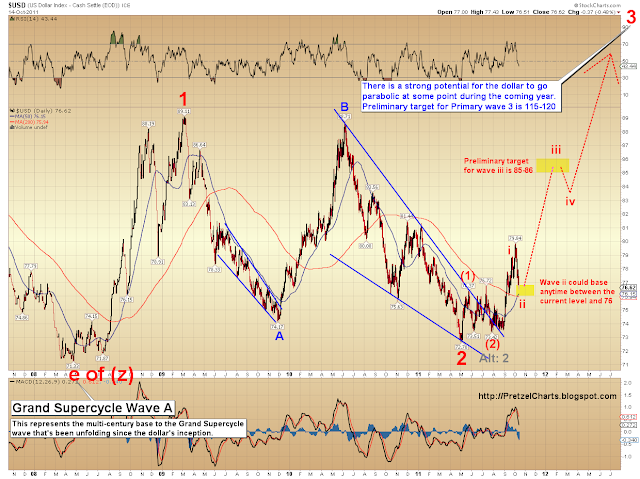 This seems to be consistent with the Elliot Wave Count on the dollar. But we will find out soon enough. I do notice that lately the media has been a lot more bullish... and I guess we need that bullishness for the Elliot A-B-C wave counter trend rally to go up and only to lose steam and crash again eventually to wring out that last bit of bullishness. Still not sure gold is going down -- I just consider it to be the slightly more likely possibility; say 60% that the top is in, 40% that it isn't. If enough faith is lost in the system, gold may decouple from its relationship to the dollar, and the two could rise together. As far as bullishness: the job of a 2nd wave is to at least mitigate the bearishness. We should hear more bullishness as well, but it isn't required. Usually happens though.